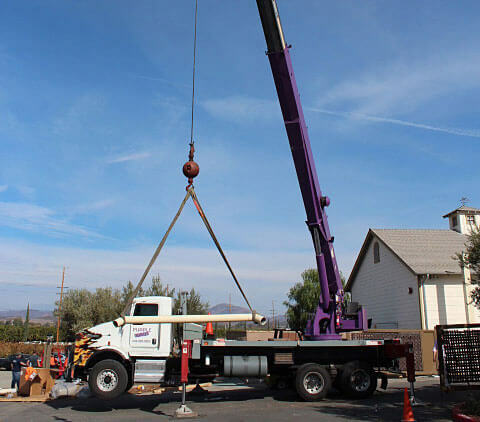 At Purple Crane, we've been providing crane service for spa installation and removal in Southern California since 1983. We have a range of cranes, with 3-ton to 75-ton capacity, and we specialize in both light- and heavy-duty lifts. Whatever your spa lifting needs, we have the right crane for the job. We also have the knowledge and experience necessary to ask you the right questions and determine the best, most cost-effective piece of equipment for your specific project. We've performed over 75,000 lifts, and our certified crane operators are skilled and experienced professionals. We believe in prompt service at reasonable rates, so your job will remain on time, on budget, and hassle-free. Whether your project is residential or commercial, Purple Crane can help with any spa or hot tub lift. We can also perform lifts for barbeques and other outdoor equipment. Our crane rentals can assist in construction jobs at commercial sites, as well as smaller, residential projects. We've helped contractors, homeowners and business owners remove, transport, and install spas, barbeques, and more at a variety of locations: parks, hotels, golf courses, country clubs, apartment complexes, private homes, and more. You can rely on our modern cranes and skilled crane operators: we can lift a spa, barbeque, or other piece of equipment from a rooftop, back yard, side yard, and even over a house or building. We also have trucks and trailers available to assist with transportation, whether for haul-away or relocation. Call Purple Crane today to find out more about our expert spa lifting services and competitive rates. Someone is available by phone 24 hours a day, 7 days a week. Our company is OSHA compliant and fully insured, and we can provide same-day certificates of insurance.